Of everyone on your gift list this holiday season, music lovers might be the easiest to shop for. If you're after the latest and greatest or just need a little inspiration, this guide has 21 music gift ideas that are certain to be a hit. This year skip the gift cards or trendy headphones that compensate with candy colors what they lack in sound quality. For fans and musicians alike, these gifts appeal to all fancies, allowing them to creatively compose their own jams, upgrade their music listening game, and add some musical ornamentation to their lives. No matter if they're more rock 'n roll, pop, or hip hop you don't stop, there's something in this lineup for every music lover on your gift list. For the old school aficionados, there are throwback accessories packed with retro cool. For those who wear their heart and passions on their sleeve, there are must-have selections of musically minded merchandise to make sure they always go out in style. Hit the right note with that special someone who just can't get enough of that HiFi sound with the latest high tech gear that will take their music listening experience to the next level. Super fans will appreciate frame-able graphics from their favorite bands of yesteryear. Not sure who's their favorite? First, work on your friendship, and then, impress them with an impressive illustrative chart like a massive map of hip-hop monikers or a periodic table of heavy metals. The lucky recipient of this Drake-inspired getup will win every Ugly Christmas Sweater Contest for the rest of their life. Browse Pop Chart Lab for graphic prints that visualize almost anything about music. The photo shown is of a poster featuring "282 sobriquets from the world of rap music, arranged according to semantics. " Other sick options include a visual compendium of guitars, the advance of audio apparatuses, and the charted connections of rock. Take your loved one right back to the '80s with this clear cassette tape player complete with AM/FM radio. Its transparent exterior means they always get to show off their original Tears For Fears and New Kids On The Block tapes. Whoever receives these beauties will never be able to go back to another pair of earbuds. A heaven-sent accessory for the audiophile on the go, these high end earbuds are both ergonomic and elegant, and are the latest from a startup quickly gaining traction and disrupting the consumer audio space. While precision-machined from solid brass, they're surprisingly comfortable and deliver first-class sound quality. This book is a must-have for any self-respecting rap enthusiast but is easily enjoyed by anyone. In the illustrated guide, the author follows the rise of hip-hop from 1979 through to the present, deconstructing the most important rap song of each year, "chart toppers, and show stoppers," and every historical rap moment in between. Complete with lyric maps, infographics, and a foreword by none other than Ice-T.
Now your favorite music lover can bring the theatrics of the stage to their very own home with these speaker light bulbs that feature super bass sounds and unlimited options for light color, even pulsing to the music. The intelligent lighting device connects wirelessly with Bluetooth to be controlled via an app and deliver high quality sound. These over-the-ear headphones by Bang & Olufsen are sleek, ridiculously lightweight, and ultra luxurious. Your favorite music-lover won't be able to take them off, ever. 8. A "DJ In A Box"
Allow your friends to engage in sonic experimentation with this Brooklyn-made digital recording tool. While its simple handmade wood housing may be deceiving, the device is capable of manipulating with "loops and pitch-bending playback for beatboxing for all-around audio fun." For the vinyl collector, this retro-styled brush will keep their prized records "spankin' clean." Now the pierced music lover in your life can top of their look with miniature 45 adapters and keytars. Another wearable of the music variety, this t-shirt lets the wearer "make complex beats with ease while strolling down the boulevards of funky-town." The getup comes with nine different drum kits and allows the wearer to make their own rhythm and layer beats by tapping the drum pads on the front of the shirt. Gives new meaning to "march to the beat of your own drum." Straight from the Museum of Modern Art is this designy three-way earphone splitter shaped like a tree branch. The device "reflects the Museum's efforts to document and display audio equipment of the modern era." For hands-on aspiring musicians (and engineers), this kit allows them to build their own instruments and sound set-ups using over 500,000 different circuit combinations and a booklet of instructions for 10 different sonic projects like "Percussion Party" and "Metal Music." No prior knowledge of circuitry required, anyone can experiment with the color-coded modules and "de-mystify the workings of analog synthesizers behind decades of popular music." This card and dice game is the answer to "composer's block." For almost all ages and all types of musicians and able to be played solo or in a group, the game inspires players to improvise, refocusing making music as a source of "joy and freedom" rather than "fear and anxiety." Ships Dec. 5, just in time for the holidays. Another gadget from the Museum of Modern Art, this whirligig-looking contraption is for the music-loving kid in your life. Your young engineer in the making can try their hand at soldering and creating a light-sensitive musical instrument with limitless possibilities. Add a little flair to your friend's bookshelf with a sliced Fender telecaster that makes for perfect bookends with rock 'n roll edge. Fender bass and Fender stratocaster bookends also available. The future rock star can jam away with this wireless guitar, compact in size at 16" but complete with real strings and real frets. Don't worry about having to listen to wailing solos or practice sessions with the tutoring app. Once headphones are plugged in, no one but the player can hear the music. Now any of your party-going friends can lose the DJ and carry around a mixer in their pocket. Hailing from Berlin where the party never stops, the "portable party-making machine" lets your work your own DJ skills without the massive mixing board. No power source needed, the pocket-sized player connects to phone or laptop to "instantly amp up" beats. Your outdoorsy friends can take their favorite jams into the wilderness with this wireless speaker "designed to withstand anything you throw at it." The durable turtle shell is in its element in the great outdoors and delivers quality audio while also being water resistant. Peruse Wolfgang's Vault for an endless selection of vintage postcards, posters, and art prints of classic bands and performers of years past. Available at a range of price ranges and showcasing a variety of talent, you're sure to find just the thing for the die-hard fan on your list. 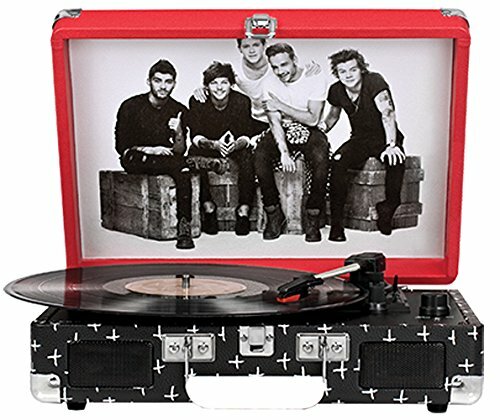 Every vinyl collector needs a turntable, and this three-speed option briefcase-styled option is portable, lightweight, and available in a rainbow array of colors (including a special edition for the 1D super fan). Perfect for transporting their favorite records wherever they go for delivering the "rich, warm sound of vinyl" through stereo speakers.